The town of Warrington has a population of over 200,000 people, which compares numerically with the likes of Swindon, Barnsley and Northampton. Yet when it comes to football, it lags way behind town's of a similar size, plus many that are significantly smaller. A town the size of Warrington, with the best will in the World, you would expect to be the home of a professional football club. But alas not, despite ambitious plans going back years, only twelve months ago did Warrington Town finally made it to the seventh tier of English football, the Premier Division of the Northern Premier League. And that, is pretty much as good as it gets, but why? You could argue that it's pretty simple really, it's the wrong shaped ball. Rugby League dominates in these parts, Warrington Wolves play in the Super League and they average around 12,000 punters through the turnstiles at their impressive Halliwell Jones Stadium in the heart of the town, but it's a Summer sport to be fair? Warrington isn't alone though, in close proximity you have the town's of Widnes and St Helens, both of whom have their most senior football teams playing two, if not three levels below Warrington Town. The conclusion you have to draw from this part of the North West is quite simply that football in it's round ball sense doesn't float the boats of the locals, they are much more in tune with the oval ball. Or are they? Could it perhaps be that with United, City, Liverpool and Everton all being within close proximity of the three aforementioned town's, the football loving public are spoiled for choice and as a result head either East or West for their Premier League fix? It's hard to say, but what I do know is that when it comes to Warrington, after Town, it's a sizable fall down the pyramid before you can start to find football clubs in the locality. 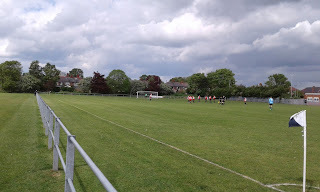 Most of them, well three to be precise, play in the Step 7 Cheshire Football League. Namely Greenalls Padgate St Oswalds, Rylands, and today's destination Eagle Sports. The Eagle Sports & Social Club is located to the West of the town and is best accessed from the M62 rather than what at first glance of the map seems a quicker route via the town centre. Situated between the suburbs of Penketh and Great Sankey, it's not the easiest place to find, tucked in behind some modern housing. However, once into the car park, the sheer size of the venue itself comes as quite a surprise. The main railed football pitch is the first piece of grass you come across, with the dressing rooms next to the car park, behind one of the goals. Adjacent is a rugby pitch, followed by another rugby pitch, yet to the rear of the social club is a bowling green. Space is certainly not at a premium. The crowing glory though is the social club, it's a massive building with various bars and function rooms. It's as impressive a place as you will see at any level of football. Clearly though it isn't just about the football, it caters for all sports, Rugby League clearly being the key one, but it also serves the local community. 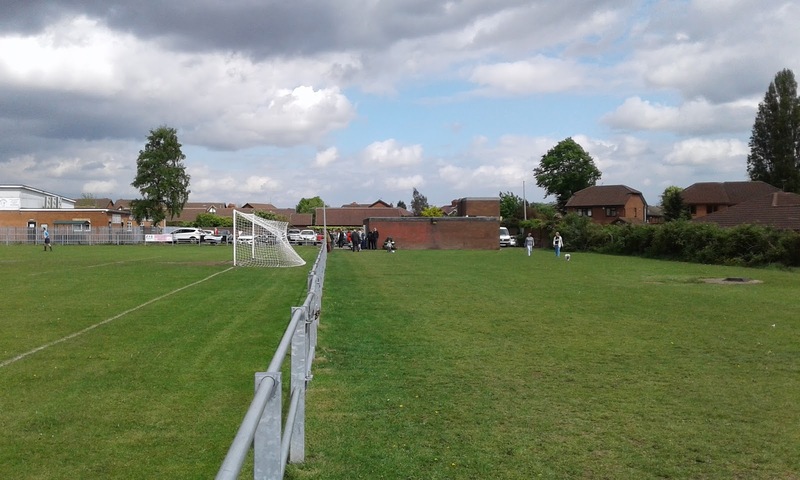 Today they were taking advantage, a Wedding Reception and a kids football session were being well catered for. Onto the football. 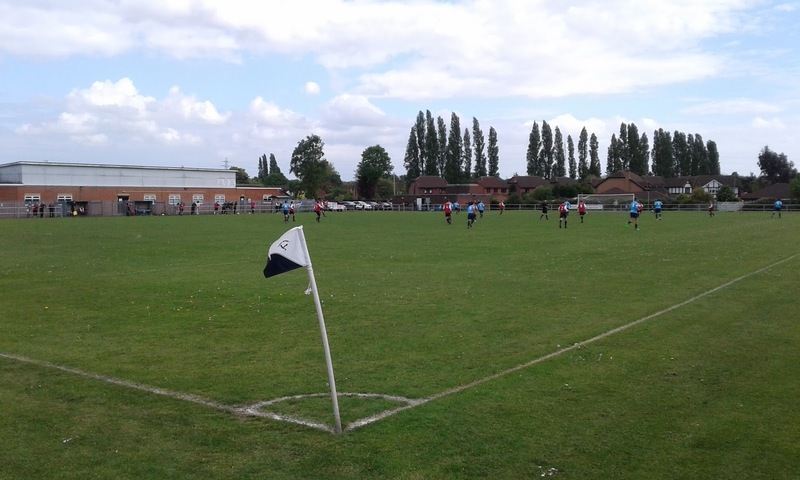 Eagle Sports had a terrible start to the season, but after a change of Manager they steadied the ship and will finish in a very creditable mid-table position. Knutsford's season I've documented previously but the report at the end of the season, which for both sides was today, will state 'should do better'. 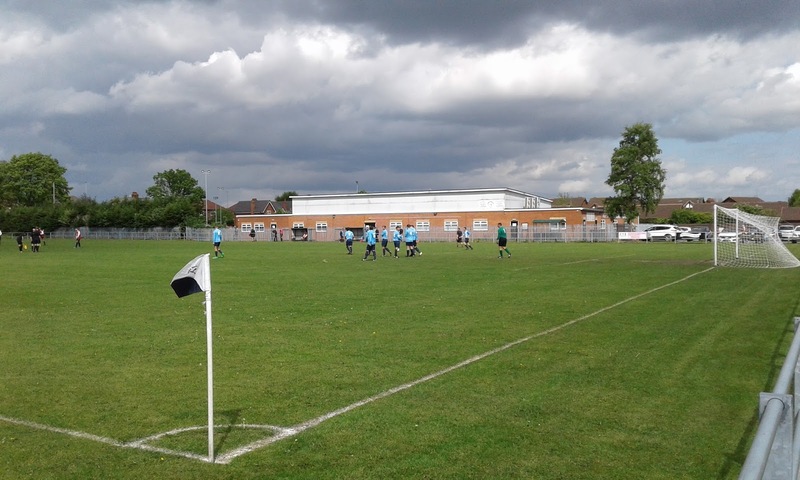 On a lovely Spring day, on a clearly well cared for, but hard playing surface, it was the hosts who spent the majority of the game on the front foot, carving out several chances but without being able to breach the visiting defence. Knutsford created a few openings but nothing especially clear cut of note. While it finished 0-0, it was a game worthy of a goal or two. It certainly wasn't played like an end of season game, and on another day it could easily have been 3-1. The game was watched by a moderate crowd of spectators, I would say around 30 or so. In the bar before the game, the television was showing the Castleford v St Helens Rugby League Challenge Cup tie, a lad in an Everton shirt had set up camp to watch it for the afternoon. That Clubhouse Again - It's A Bobby Dazzler!